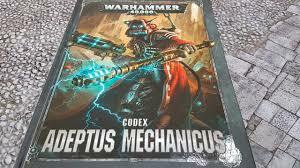 I am continuing my review of the new Ad Mech codex. Today I am focusing on Stygies VIII and Ryza. The Stygies Dogma is like the raven guard one. Units firing at units with this dogma get -1 to hit when firing further than 12". I like this one. Anything to make you harder to hit is a bonus. Seeing that I want to stay a ways back when playing ad mech this goes hand and hand with my play style. The warlord trait is ok if you are in a xenos heavy meta. It gives you +1 to wound rolls against units that don't have chaos, imperium, or unaligned keywords. +1 damage will help agains vehicles and tyranid monsters. More than likely I will take one of the non forge world ones though. The stratagem allows you to set one unit up in reserves and then place them anywhere more than 9" away from enemy model. The one time I think I might use this is with the Fulgurite priests. Setting them up further down the board is better than them having to foot slog it across the board. Just have to cross your fingers for the 9" charge. The relic is decent if you are in hand and hand a lot. A character equipped with the Omnissian's hand gets to roll a D6 at the end of the fight phase for each enemy unit within 1" and on a 4+ the enemy unit takes a mortal wound. The problem is you need a character to use this and I don't want my characters to be in combat. Maybe I could add a patrol detachment to my list with a enginseer and some priests and just throw them at the enemy. It seems like a lot of points though that could be used for more robots or duncrawlers. This is my favorite so far. The dogma is fits into my play style and if I am playing against a xenos player I could use the warlord trait. If I had some fulgurite priets I might consider running these so I could get them across the board faster. The Ryza dogma allows you to re-roll wound rolls of 1 in fight phase. if you are using ruststalkers, dragoons, infiltrators and priest this is a dogma for you. Seeing I like to sit back and shoot most of the time I doubt I will get to try this out. The warlord trait allows you to add 1 strength and damage to one of your warlord's weapon that is not a relic. This is a nice little buff to your warlords weapon. It would have been nice to add some AP but I can't complain. I would probably take this on my warlord and the relic on my other HQ. if I only had 1 HQ then the relic bets this. The Stratagem is a handy bonus. For 1 command point you get +1 to wound and damage for all plasma weapons. This makes the plasma destroyers a little more advantageous to use over the grav cannons. Since Ryza is supposed to be the masters of plasma it was a nice fluffy nod to them. The relic is a volkite blaster replacement. The XCIX is 1 better in strength AP and Damage and still give an extra mortal wound when rolling a 6+ to wound. This is an easy upgrade to your characters if you don't want to use any of the other relics. I feel Ryza is a decent forge world for someone who has a bunch of close combat in their army. I want to get some priests since this edition came out. I think GW did a good job buffing them to make them at least worth looking at. I would love to run some proxies just to see how they do since getting a full 20 man squad would be around $160. Anyone know a cheaper alternative model? Well that is all for Stygies VIII and Ryza. I can see me trying out these worlds if I had the right models. Next up is Lucius and Agripinaa. Hope these are helpful for someone out there. Questions, Comments, For the Omnissiah?